For the first time, the U.S. & Canada Green Building Councils have partnered to host the 10th annual Greenbuild International Conference and Expo in Toronto at the Metro Toronto Convention Centre, October 4-7, 2011.Greenbuild will bring 25,000 professionals from over 100 countries to Toronto. In addition to 120 education sessions, Greenbuild is offering other learning and networking opportunities at its International, Affordable Housing and Green Jobs Summits, and Green Building Tours. Greenbuild delegates also receive free admission for most activities at Canada House, hosted by the Canada Green Building Council and conveniently located at the Steam Whistle Brewery Roundhouse (adjacent to the Metro Toronto Convention Centre). There they will experience Canadian hospitality as they explore the technologies, products, services and know-how driving the green building industry. 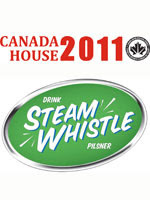 Steam Whistle has a reputation as a green manufacturer, the only Canadian previously named by bloggers in the list of North America’s greenest breweries, recognized in 2009 at the Green Toronto Awards http://www.toronto.ca/greentorontoawards/2009/finalists.htm for its energy conservation and use of alternative energy forms, and in 2010 as one of Canada’s Greenest Employers. http://www.canadastop100.com/environmental/ Most recently, the Ontario Ministry of the Environment honoured Steam Whistle with the Minister’s Award for Environmental Excellence. Beer Drinkers can enjoy a clear-conscience while drinking this local, independent brew also awarded a Gold Medal in the BEST PILSNER category three times at the Ontario Brewing Awards.